Aloha Mirasierra is a small and exclusive residential complex situated in the heart of the Golf Valley by Puerto Banús. It is literally surrounded by golf courses and is ideally situated within walking distance to some of the finest restaurants in Marbella and trendy cafés and supermarkets. It is also home to the Manolo Santana tennis club, a bowling green and the excellent Aloha International College. Aloha Mirasierra consists of just 48 luxurious apartments and penthouses built in Andalusian village style. There is a central security office manned 24 hours a day and extensive landscaped communal gardens with swimming pools for adults and children. This exclusive estate has a private access road and spacious underground car parking and storage facilities.The apartment enjoys a large south-facing terrace and boasting view over the swimming pool, perfect for sunbathing and dining al fresco. 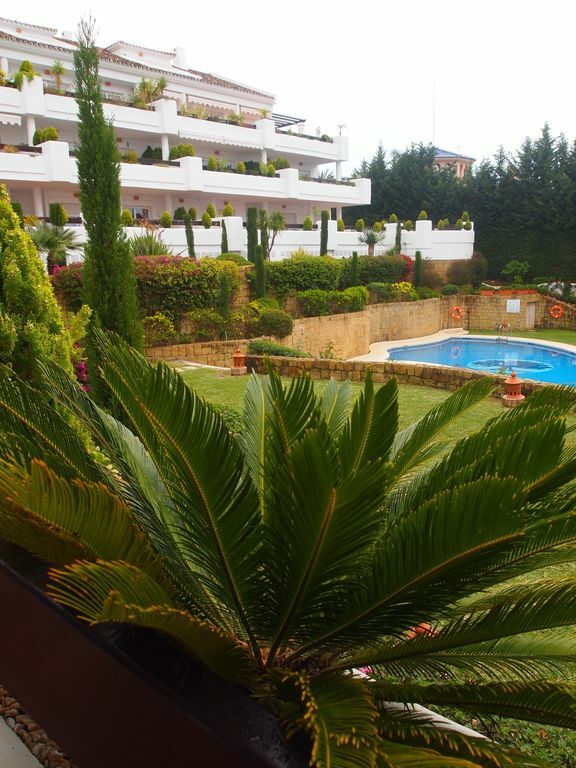 Located in the breathtaking beauty of Neuva Andalucia, Spain Aloha Mariseirra is a truly stunning luxury two bedroom apartment, the ideal place to escape to for a break to revitalise your resources whether for a short stay or for a longer period. Fully equipped and beautifully designed, Aloha Marisierra is part of a unique development of luxury holiday apartments surrounded by a great and outstanding choice of sporting facilities in particular the beautiful and challenging golf courses of La Quinta and Dame de la Noche as well as the Manala Santanas Tennis and Paddle Club, horse riding, a squash club and various other excellent health clubs. The world famous marina of Puerto Buenos with many clubs and bars is a 3 min drive away and restaurants, supermarkets and banks are all within walking distance with the classy and glitzy city of Marbella close by. The apartment offers outstanding features, large balcony with sun lounges and dining table, great views, swimming pool on-site. Golf: There are many golf clubs located in the Malaga Region, the closet to our apartment is Aloha Golf Club, Urb Aloha, Nueva Andalucia Marbella. However there any many others available to choose from that offer tee times for non members, such as Atalaya Old and New Golf Course, Cabopina Golf Club, El Paraiso Golf Club, Estepona Golf, Coto La Serena, Flamingos Golf, Greenlife Golf Club, Guadaiza Club de Golf, Guadalmina Golf North and South, La Cala Resort, Club La Siesta, Guadalhorce Club de Golf, La Dama De Noche Golf, La Quinta Golf & Country Club, La Zagaleta, La Duquesa Golf & Country Club, Las Brisas Real Club, Los Arqueros Golf & Country Club, Los Naranjos Golf Club, Lauro Golf, Magna Marbella, Marbella Club Golf Resort, Marbella Golf & Country Club, Mijas Golf, Miraflores Golf, Monte Paraiso Golf, Montemayor Golf & Country Club, Rio Real Golf Club, Sotogrande Real Club, San Pedro Golf Club, Santa Clara Golf, Santa Maria Golf & Country Club to name just a few! Ski: One of Europe's most southern ski resort is located just two hours drive from the Costa Del Sol, have your cake and eat it, ski in the morning and sunbathe in the afternoon! Enjoy the extensive slopes that the Iberian Peninsula can give you, with one pass giving you access to most parts of the mountains!